Franz West, Lemur, 2009. Papier-mâché, styrofoam, metal, acrylic paint. 176 x 136 x 63 cm. © Archiv Franz West. Tim Van Laere Gallery presents its third solo exhibition by the internationally acclaimed Austrian artist Franz West (1947, Vienna–2012, Vienna). West is without doubt one of the most important sculptors and environment artists of contemporary art. His oeuvre is characterized not only by the forms he invents, but also for the communicative quality with which he directly addresses the viewer, urging him/ her to participate. The exhibition brings together various aspects from the broad oeuvre of Franz West. Both collages, sculptures from papier-mâché, plaster and polyester, furniture and installations from different periods of his career are shown. In the mid-1970s, West made his so-called “Paßstücke” (Adaptives), movable sculptures made of plaster and metal that were intended to be moved, touched, and handled—transforming viewers into participants. For West, the essence of the artwork is not the aesthetic quality, but how the work is used. These objects stimulate the ingenuity of the public and disrupt conditioned behavior in the exhibition space. From the 80s, he incorporated more fragile materials, such as papier-mâché and glass bottles in his sculptures, which he combined in the “Labstücke” (Refresher Pieces). As a consistent continuation of the “Paßstücke,” West has been working since 1987 to construct furniture for sitting and reclining, using prefabricated elements and discarded industrial products which he covered by stretching fabrics or carpets over them. His work makes us think about our living space and the social and personal activities that are happening there. The artist aims to create a certain interaction between artwork and viewer, between object and subject. An interaction that must ensure that art becomes an open and interactive process. Later in his career, Franz West also focuses on sculptures in the public space. 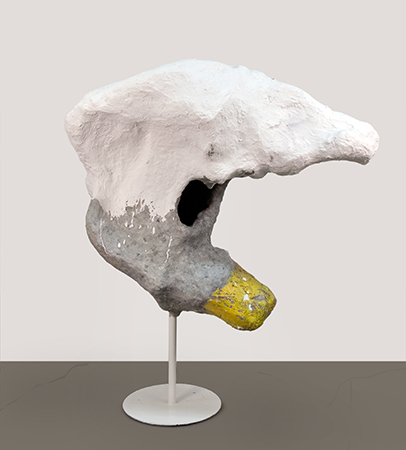 Franz West received international recognition since the 1980s. His work has been a fixture in countless international survey exhibitions such as Documenta and Biennales all over the world, and it is included in major public collections including Center Georges Pompidou, Paris; Tate, London; Middelheim Museum, Antwerp; M HKA, Antwerp; S.M.A.K., Ghent; Museum Ludwig, Cologne; The Museum of Modern Art, New York; Museum for Modern Art (MMK), Frankfurt; Museo Nazionale delle Arte del XXI Secolo (MAXXI), Rome; Albertina, Vienna; Museum of Contemporary Art, Los Angeles; Walker Art Center, Minneapolis; Philadelphia Museum of Art, Philadelphia; and Hirschhorn Museum and Sculpture Garden, Washington D.C. In fall 2018, a major retrospective will open at the Centre Georges Pompidou, Paris, and will travel to the Tate Modern, London the following year.